A joint venture between the Volvo Group and Eicher Motors Ltd., VE Commercial Vehicles Ltd. has been charting its own course in a market that has traditionally seen two big players battle it out for a larger share of the market pie. With proven technology from the Volvo Group at the core, the company has been providing the Indian market with some of the most innovative and technologically advanced heavy duty trucks, amongst others. 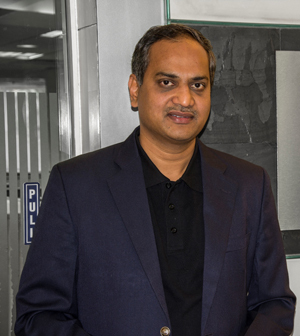 Rama Rao AS, Executive VP – Sales, Marketing, Aftermarket – VTI Division, VE Commercial Vehicles Ltd. speaks to Shashidhar V about the changing dynamics in the Indian market, and their preparedness for introducing future technologies into the Indian market. What is the one big change that you are seeing in the market today? The biggest change that we are seeing now is that customers are looking at higher capacity trucks. And, also, in some of the larger states, the government is not permitting trucks to carry loads beyond a permissible legal limit. So, there we see a big shift in terms of haulage trucks being used for transportation of aggregates, which is a very recent phenomenon. That is a big shift in terms of bringing down the cost per customer in their business. So, we see that trend very clearly coming out. We have built some of our trucks especially for such applications. While we have some of our traditional offerings, which are the tippers meant for more severe applications, the haulage trucks cater to more surface to surface transportation. So, we see a new trend in the country, which I believe is good, because this is what is going to keep the costs under control for customers, and thereby help them in becoming more profitable. Also, there is a whole lot of maturity coming in the entire industry. So, many manufacturers are looking at their products and seeing how they can be adapted to different types of applications. This was missing a few years ago. So, we see both the customers and manufacturers are now looking at how they can customise the offering. The platform could be the same, but then, how would you customise the platform? The industry was impacted due to multiple decisions not of their making, be it the demonetisation, or the introduction of GST, to name two. And, to add to it, channel checks with logistics players show that not many orders were placed for long haulage trucks. And, then, the mining segment was stressed. So, how have you been impacted by this? In terms of demonetisation, the industry has come out rather quickly. But, the change from BSIII to BSIV did impact the industry. It took some time definitely to make the switch, especially in terms of getting the components into the manufacturing system. That took longer time because it was an overnight shift, which, of course, has impacted the entire industry, and not just Eicher in particular. But, now, that too has settled down quite well. Now, if you look at the performance of the industry month-on-month, it has been going up, which means that there is absolute parity for operators. So, we see the big operators who have been waiting and watching have now come back and have started buying. So, a replacement cycle is what one can see happening now. Large customers are looking at modernising their fleet. Also, most are showing an interest in replacing their lower capacity trucks with the higher capacity ones. So, we are seeing a demand for those as well. What are some of the new technologies that you are brining to the Indian market? If you look at the technology, being a part of the Volvo group, we use the same engine, for example. It is the same Volvo engine that you would find in Europe. We have been producing those engines here and exporting them for the last few years. And, that includes the Euro VI variant. So, in terms of technologies, we have all the technologies that we need and more. What we try to do is adapt those to the Indian conditions. If you take a look at the electronic and electrical architecture, we again take it back to the Volvo Group. Today, the telematics solution that we offer, for instance, is the best one can find in the country. So, similarly, we have many new technologies that we offer our customers. One aspect of these new technologies is that customers benefit with the ready information that is generated, such as the usage of fuel, usage of the machine, etc., which makes their business profitable and more productive. But, on the flip side, how are you using that data that is generated to make better machines, better trucks to your customers? The data that is generated goes to our product development team to get a better understanding on what is going on with the engine, for instance, and how they can make changes that would benefit the customer. They may have to tweak the engine. How do we increase the durability of the machine, for example? We analyse the data to get a better understanding on how the machine is being used, in what conditions, how long, and if there are failures, what are the factors that are leading to those failures, etc. By analysing the data, we get a much better understanding so that we can develop more robust machines that will ultimately help our customers. Speaking of engines, there has been some debate on SCR Vs EGR. Where does Eicher stand on this? On that front, we have both the technologies. And, we have the entire product range which offers both these technologies. Which technology is better, that only time will tell. But, our association of being part of the Volvo Group has meant that we have never had to struggle for any technology. It is there, and we take it and adapt it to our products and markets. On the demand front, where do you see it coming from in terms of this technology? I think it is too early to say anything at the moment. But, I definitely feel that, if you look at large fleet operators who have been in this industry from a long-term point of view, they prefer the SCR technology. Having said that, if you look at the numbers coming in, it is still largely from those customers who buy one or two trucks, and their knowledge on these technologies is still limited. They are still in the learning phase. So, it is difficult to say how this large market of ones and twos will transform in the coming years. But, the biggies who are driving the modernisation in the industry, they seem to prefer the SCR technology. China is betting big on the Lithium-ion battery technology. Europe too is looking at hybrid technology. With your association with the Volvo Group, are there plans to introduce any such new technologies in the country? Presently, there are lot many things which are on the table. But, as a market, if you look at India, we continue to remain a traditional market of using petrol or diesel as fuel. I don’t think that in the next 5-10 years, that is going to change. But, you will have a few trucks coming in select applications, such as intra-city applications. In those areas, we would see a few numbers of either Lithium-ion technology, or hybrid. Again, in the smaller capacity trucks, you will see a quick move to electric vehicles. But, when it comes to larger trucks, it will be Phase II, in my opinion. In Phase I, we would see smaller trucks and buses, and Phase II would be heavy duty trucks. Heavy duty trucks are used for long distances, and so, it would mean that we need to have the infrastructure in place first. And, all that will be driven largely by the government policies. As a technology, we can bring it in very quickly. The Volvo Group has been investing heavily in hybrids, electric vehicles, etc. So, when the time is ready, when the infrastructure is in place, we will be ready with the product. The industry segment that you operate in does see a fair bit of discounting. As a market, I don’t think we can wish away discounts. There is excess capacity in the market and we are one of the largest markets in the world. So, in that perspective, we have a good number of players in the industry. So, naturally, we have all built capacities. So, it is something which we would like to change. But, then, there isn’t one single brand which I believe is not offering lower prices than published by them. We are trying to see how we can do our bit in terms of providing the right value proposition instead of just the discount. We are not yet there; it is going to take some time for us. But, then, I think we cannot simply wish it (discounting) away. It is going to be there for some more time. How have the fluctuating prices of inputs, like steel, impacted your margins? We have three platforms – the Pro-5000, Pro-6000, and Pro-8000. Each platform caters to different customers, their needs and applications. So, the situation is different for different products. So, where you have customers whose understanding of technology and their needs are different, then, of course, the price becomes paramount. But, when customers look at productivity, efficiency, etc., then, you have a different situation. So, the discounting bit comes in depending on which segment you are addressing. It is not the same across the segments. What, according to you, have been some of the industry pain-points that need to be addressed? One of the primary pain-points pertains to government policies. They change rather rapidly. For instance, they said that we need to provide air-conditioning in the trucks. And, then, they come out with a policy when we are all ready that even if we provide a blower, that would do. If the policy was clear well in advance, it would give us time to prepare our suppliers, our own manufacturing, etc. As an industry, we would be better prepared. Our association of being part of the Volvo group has meant that we have never had to struggle for any technology. It is there, and we take it and adapt it to our products and markets.